To improve the hydrological conditions by stabilizing mean water level and to prevent the decline of the water level to very low. 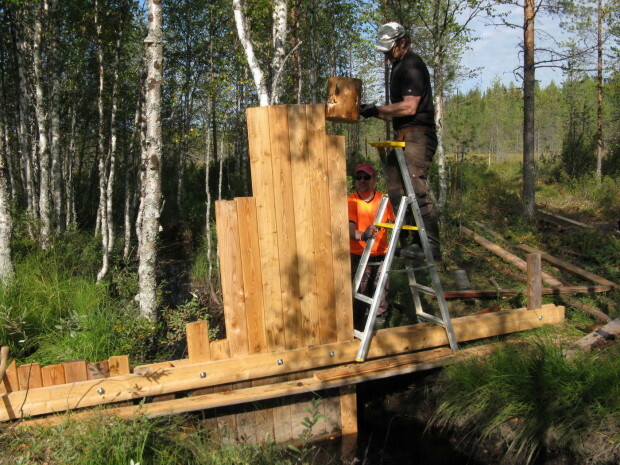 To present restoration actions of Latvalampi, where the water level was stabilized by wooden wall built in the stream. 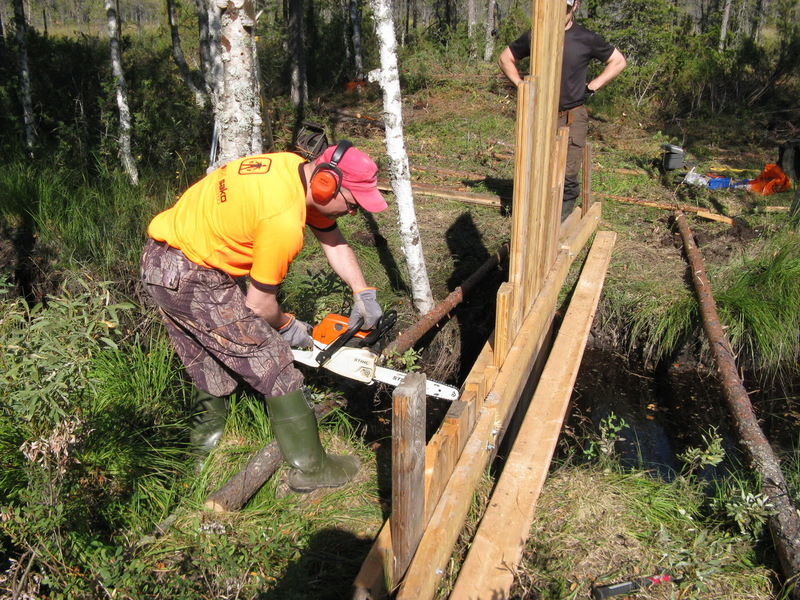 Latvalampi after restoration actions 26.10.2015. The water level will remain as a natural level trough summer. In future there will be suitable conditions for example to waterfowl. Photo in left (before restoration actions): the hydrological conditions were propitious at Latvalampi after spring flow. Photo in right (before restoration actions): during summer the water level decreased and only few meters wide and very shallow stream remained. Muddy bottoms began to unfold over a wide area. Maps © National Land Survey of Finland, license number 4496/MML/15. Latvalampi in three separate years before restoration actions. In late summer water level tended to decrease to very low level and the bottom of Latvalampi became visible. Wooden wall is ready. 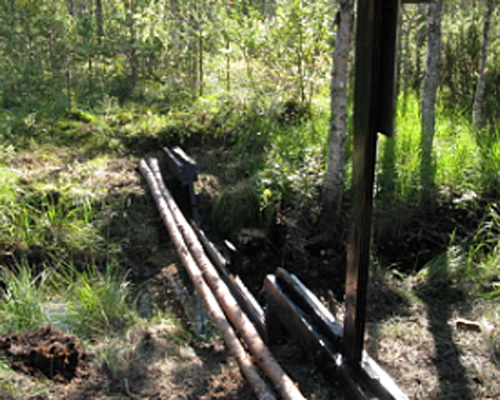 Small and low maintenance water control structure raise water level over low grade. By removable planks it is possible to regulate water level. Photo: Juha Siekkinen 25.8.2015. Finally the wall was sawn the right shape and height. The wooden wall was painted with tar derived from the wood of pine as a water repellent coating and it helps to prevent decay. Photo: Juha Siekkinen 25.8.2015. The rest of the wall was built human-made. 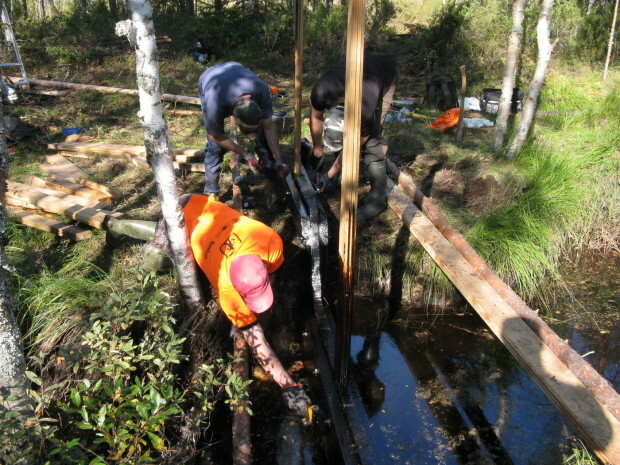 The plans were beaten with a sledge hammer in the soil to a depth of 1 meter. Photo: Juha Siekkinen 25.8.2015. The planks were attached to the horizontal planks with bolts and afterwands also with nails. Photo: Saara Siekkinen 28.7.2015. The planks were depressed one by one. The lower end of the planks were sawn in a 30-degree angle, so that they settled tightly against each other. Photo: Saara Siekkinen 28.7.2015. First two planks were depressed in stand in both sides of wooden wall. 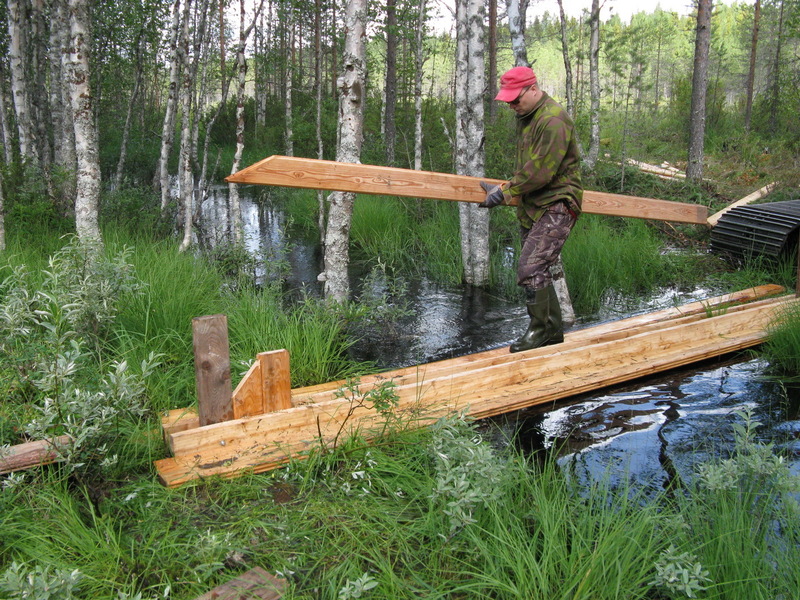 Next two planks were attached horizontally between them. 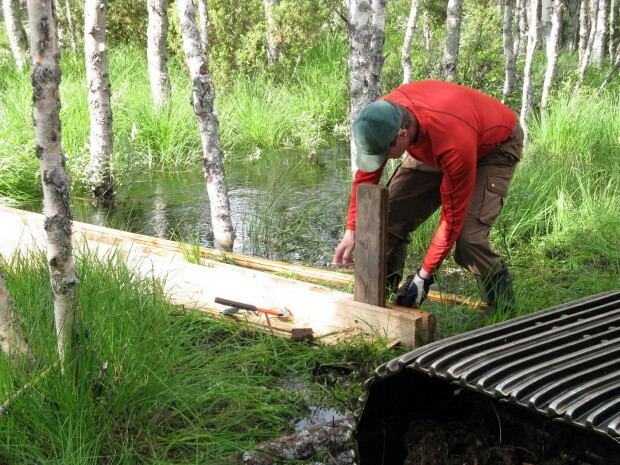 We used larch which is susceptile to decay. We did not like to use timber with deeply impregnated with the preservative because it has adverse effect to water and benthic communities. Photo: Saara Siekkinen 28.7.2015. The place where the wooden dam was built before construction work. The dam was built about 50 meters downstream from the lake Latvalampi. Photo: Juha Siekkinen 28.7.2015.